Propagating holly bushes through woody stem cuttings does not require any special equipment. Through proper selection and cutting the correct stem, a seedling will grow that can be transplanted the second year growing season. 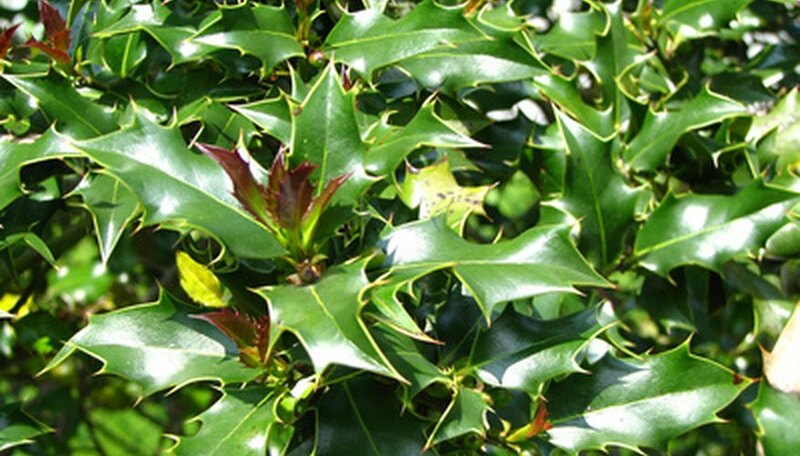 While the holly bush is a broadleaf evergreen, propagation must take place during the late summer to winter months. According to Washington State University, taking a semi hardwood cutting from the holly bush has a moderate to high probability of taking root. Select last year's growth on the holly bush mother plant, during late summer into the early winter months. Cut a 6- to 8-inch-long stem from the end of the plant. Remove the lower leaves, 2 to 3 inches from the cut end. Dip the cut end into the rooting hormone powder. Allow the white powder to coat the entire lower end where you removed the leaves. Mix equal parts of peat moss and sand as the potting soil medium. Fill a 6-inch-diameter pot, with bottom drainage holes, to within 1 inch of the top rim of the pot. Push a pencil into the soil to form a hole for the placement of the holly bush stem cutting. Insert the cut end of the stem cutting into the preformed hole. Avoid removing the rooting hormone powder from the cutting when placing it in the hole. Firm the soil around the cutting. Water the potting soil to moisten. Keep the soil medium moist, but not overly wet. Place the pot in a warm location out of direct sunlight. Inspect daily, remove any dropped leaves from the soil surface, and keep moist. Tug on the holly cutting after two or three months from initial planting. If you feel resistance, the stem cutting is taking root. You can place a large piece of plastic food wrap over the cutting and plastic pot. The plastic wrap will act like a mini greenhouse and retain moisture. Take care when using a plastic tent, as the stem cutting may overheat if placed in a windowsill with access to sunlight. Allow the holly bush stem cutting to remain in the individual pot for up to one full year. Transplant the new holly seedling the second following spring, or approximately 16 to 18 months after initial planting.